A plastic document holder with variable height and angle settings. 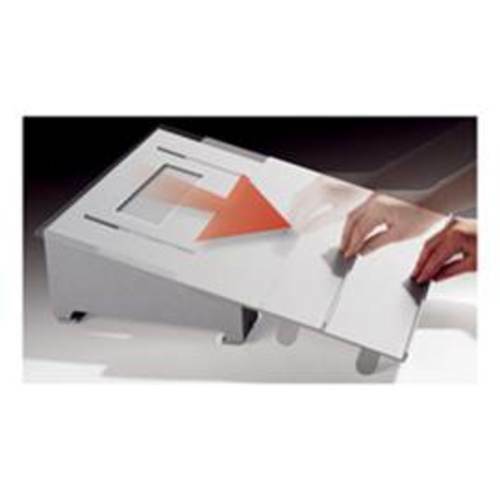 It features an adjustable sliding platform which can be used as a writing board. It can be positioned between the keyboard and the monitor. Comes in one size (A3) only. Document holders may help encourage correct posture when performing desk or workstation jobs, eliminating the need to change neck and head angle when reading documents and typing text into the computer. The docuglide can benefit workers who are required to work on written documents intermittently with keyboard and mouse use. 1. Position Docuglide in front of keyboard; or have the computer screen sit on top of Docuglide. 2. Height of the docuglide can be increased by adjusting the legs at the front and back. 3. Small pegs slot into three holes to securely raise the overall height. 4. Adhesive hook and loop (hook and loop tape) pads are provided to stabilise the rear legs on the desk. Model Doculglide Document Holder: Only one model.